Here we see two crabs fighting each other with a sword in each claw. Video games truly are the best. 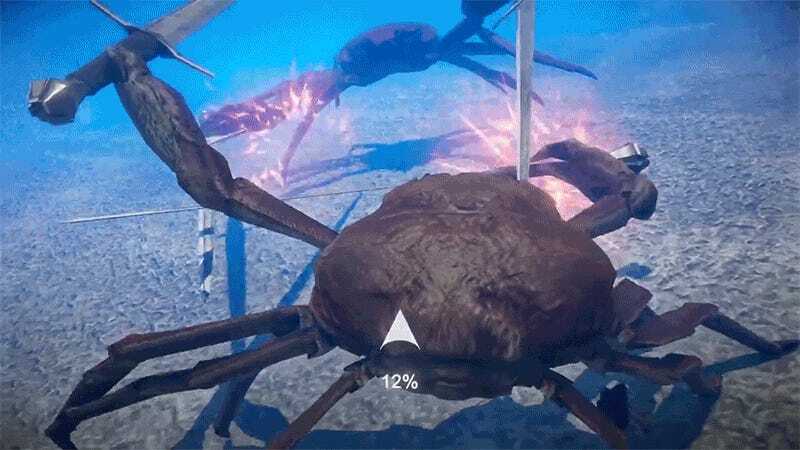 In-development video game Kani no Kenka, or simply FightCrab, is the latest in a series of aquatic battle simulators from Japanese independent developer Nussoft. Rather than the party-based strategy action of Ace of Seafood, available on Steam, PlayStation 4 and recently released for the Nintendo Switch, Kani no Kenka focuses on more personal battles. With swords. Even bare claws are used in the vicious battles, where one crustacean attempts to weaken the other in order to flip them onto their back, effectively pinning them. There’s no confirmation that striking their weak spot will cause massive damage, but there’s dashing and there’s grabbing. It’s pretty much crab wrestling, and it’s beautiful. There’s no release date for FightCrab, nor have any platforms been specified. We can but hope it shows up everywhere, and soon. In the meantime, we can all follow the developer @NeoNusso on Twitter for the latest teasing snippets. Like this one.